I wrote Leave the Grind Behind for people who have built a good career, are probably comfortable, yet have an itch—a realization even—that this isn’t all life is about. The book has been a smash hit, exceeding my expectations. It hit numerous #1 Best Seller lists and became a “Hot New Release” on Amazon.. This book is dedicated to those ready to forge their own path, get more out of life, and burn their imprint on the world. You want more money, more freedom, and to build your own legacy. Perhaps you want to carve a future by leveraging your talents to freelance, consult, or become an entrepreneur. Leave the Grind Behind is packed with actions, habits, and tools that will enable your success and explode your results. My name is Justin Gesso, and just about a decade ago I was in your shoes. I had an MBA and a good run in the corporate world, I was comfortable…but I wanted more. I wanted out of the grind. I wanted more time, more money, and more of a life on my terms. This book goes deep, this isn’t some book with a few chapters of high level fluff. I get down and dirty explaining how to develop your mindset, make the decision to go out on your own, and then give you multiple ways to accomplish this based of of my own real world experiences. You see that time is your most valuable asset. You know that spending the majority of your waking time working for someone else’s dream won’t let you achieve the life you want. But through a whirlwind of events, you’ve ended up a Cog in the daily grind, working for an upper-middle class salary with no real end in sight. Your dreams are fading. But you’re not ready to go out without a fight. If this sounds like you, keep reading. You’re ready for more than a job. You’re ready to venture into a realm that will be more rewarding, more exciting and more personal. You’re ready for something that] will make you a fortune. While I hope this allows you to completely kick your job and spend as much time as you want on projects that excite you, I realize that can be a daunting proposition. If you’re not quite ready, this book will give you plenty. Quit your day job altogether and to follow your passions and become a consultant, a freelancer, or an entrepreneur. Create new revenue streams, while working your current job or not. Complete that passion-project on the side. I hope this book convinces you to leave the grind behind and start a life in which you drive the results. A life in which you earn money via multiple channels, are in control of your time, do things you enjoy, and leave a legacy that makes you proud. Will this Book Work for You? There is no shortage of self-help, personal-development, and get-rich books on the market. To me, that’s great. My life is a journey, and I need fresh sources of inspiration and ideas to keep me motivated and challenged. I hope this book provides that for you. But I also think it can do something more. Many books come from authors who’ve had one particularly large success. While I’d love to fall in that category myself, this book provides a more generally accessible path. It gives you the tools to achieve repeated excellence. And it should position you to greatly increase your odds of achieving those one-time exceptional events. But, that doesn’t need to stop you. 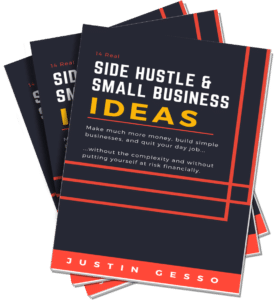 This book is a guide to transitioning from being a Cog to being a Grinder as quickly as possible while also greatly reducing your risk. To put this concept in the form of an analogy, many get-rich-quick authors have hit a one-time bases-loaded homerun. And they’re excited…I’d be too. They want to teach you how to step up to the plate for the first time and nail a bases-loaded homerun. I consider strong W2 wage earners as hitters of singles. Is it best to go directly from hitting singles to trying to hit a bases-loaded homerun? It sounds good, but it won’t be practical for everyone. Many of us would end up causing the whole field to be thrown out. And that’s the danger—since it’s not practical, you end up striking out. Or worse, you take no action at all. But what if there’s a better option? What if you could start hitting doubles and triples over the course of this next year? What if within two years you were coming to the plate in bases-loaded situations? That’s where I will take you with this book. It will help you build the legacy you envisioned yourself having. You will develop a plan for leaving the grind behind, execute on it, and do so with minimal risk. Buy Leave the Grind Behind!